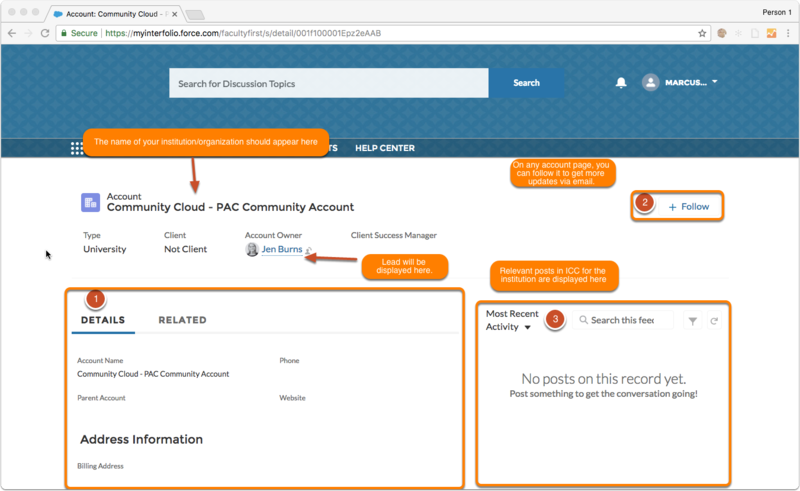 The Interfolio Client Community has it's own unique set of account settings and profile information, separate from the rest of the Interfolio clients, in order to allow Institutional administrators the ability to customize how much they would like to participate in the community discussions and support. 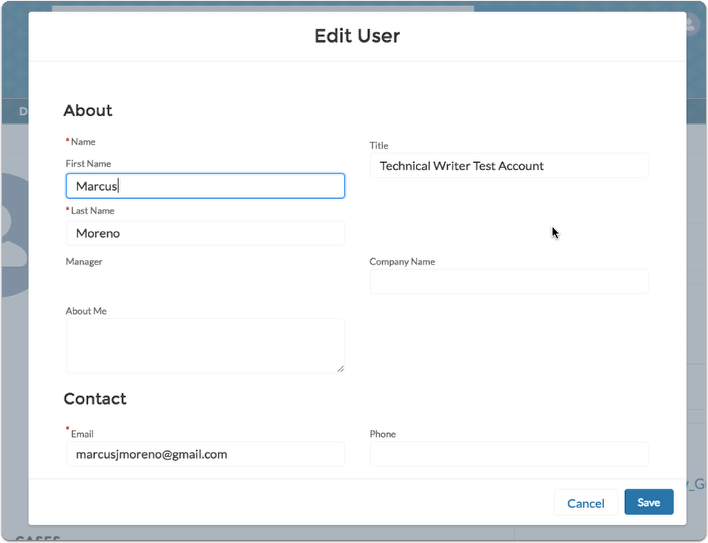 All users can access and manage this information and settings through the User Account Menu. From the profile information page, you are able to edit your information, view and interact with your personal feed, view relevant cases, upload files, view groups, and your influence. 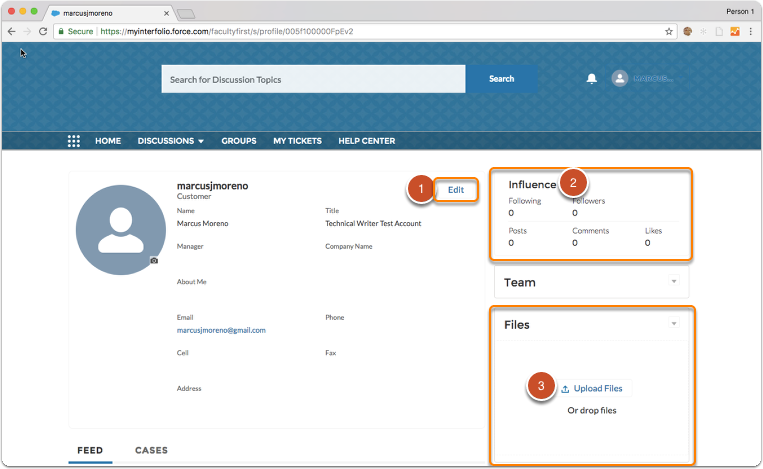 Your influence is measured by your engagement with the Interfolio Client Community platform. You can view how many people you are following, how many you are being followed by, as well as your total posts, comments, and links. After clicking the Edit button, a window launches and you are able to modify your profile information. 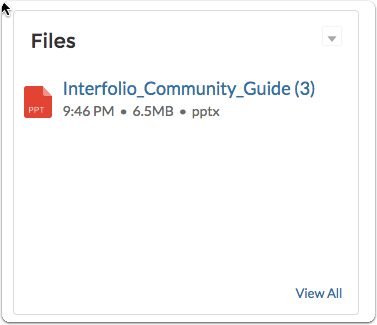 You can upload relevant files for storage and later use, directly to your profile, that are not publicly available. 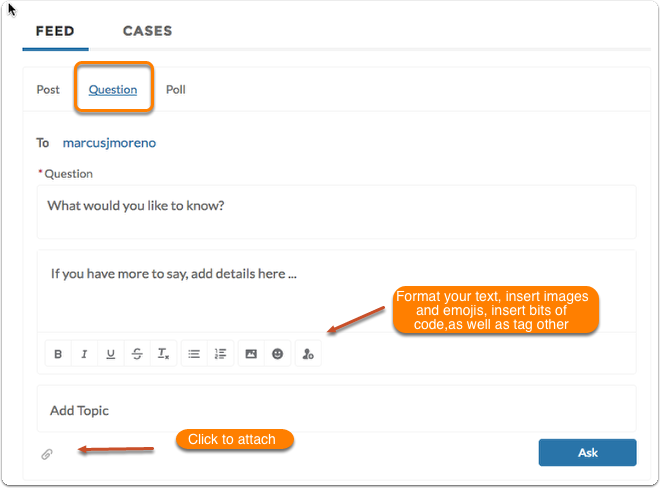 In your feed, you can see and search for relevant posts, questions, and polls, for you to interact with, and the ability to post your own. 2.1. 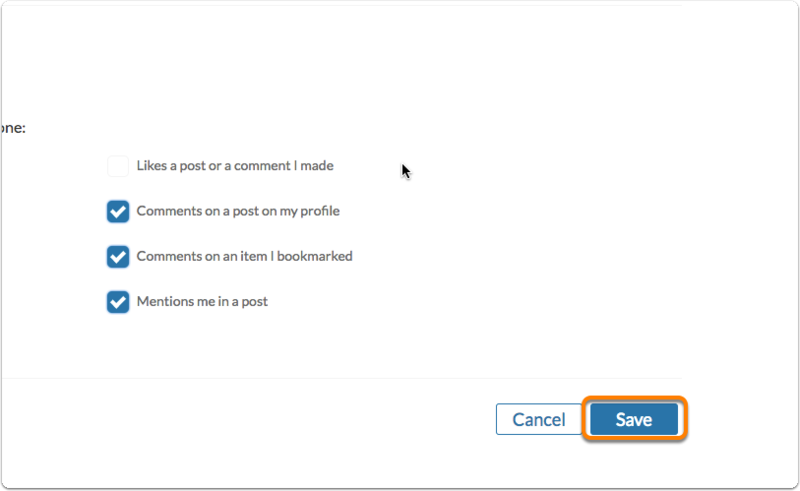 You can create a posting on the displayed feed, with information, images, links, tags, etc and allow people to reply. After clicking, you can monitor the posting and will be notified of any responses or updates from other users. Click the arrow button to an item on your feed to see additional options. If you have the proper permissions, you can edit, delete the topic. After clicking 'Delete' a window will pop-up to confirm the deletion. If you select Bookmark, then a post will be started and marked for later reference. 2.2. 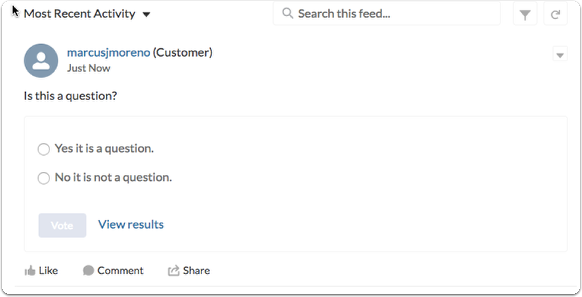 While in the feed pane, click the Question tab to create a Question to be answered by other community users. 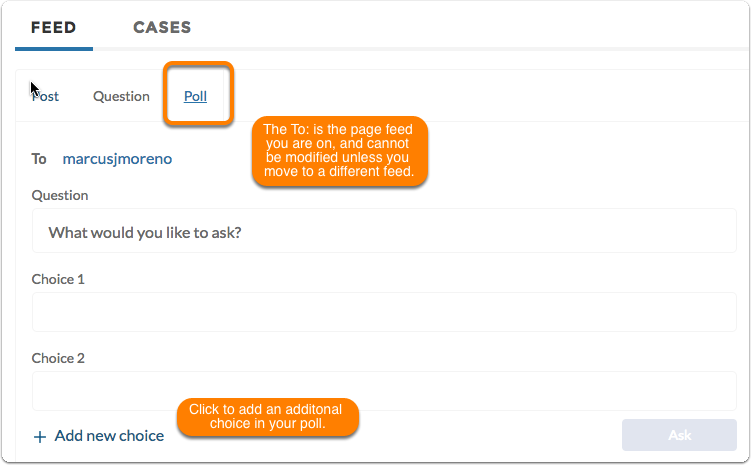 When finished Click Ask to ask the poll and a question like the below will appear. Users can answer and see the results. 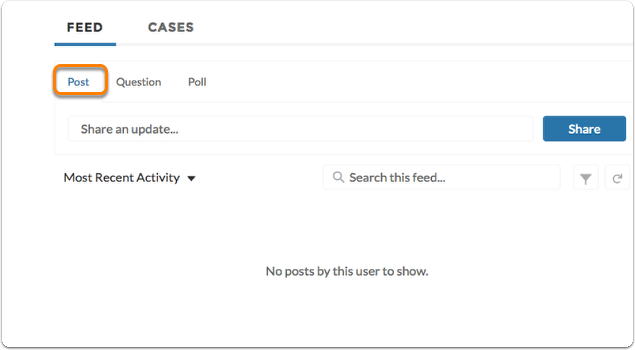 Next to your feed tab, select the Cases tab to view relevant submitted support cases/tickets, and also create a new one. Users can view the group associated with your account, if they are set to be visible. 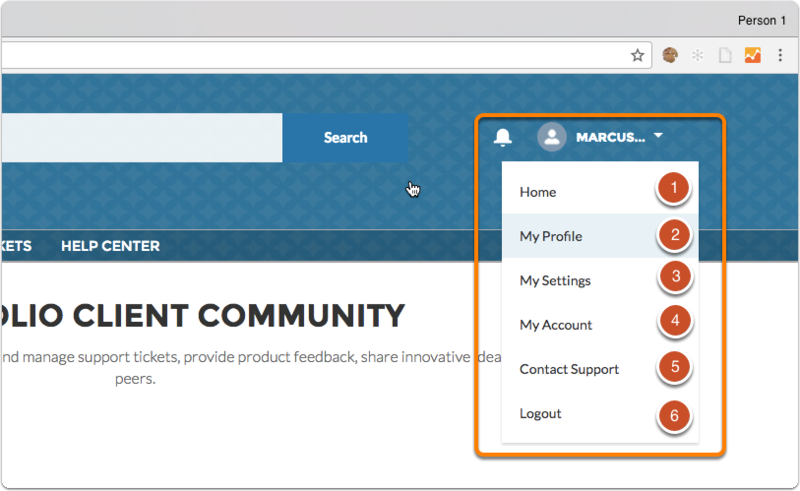 On the settings page, a user can update their email address, location/locale, timezone, profile visibility and Interfolio Client Community notifications. 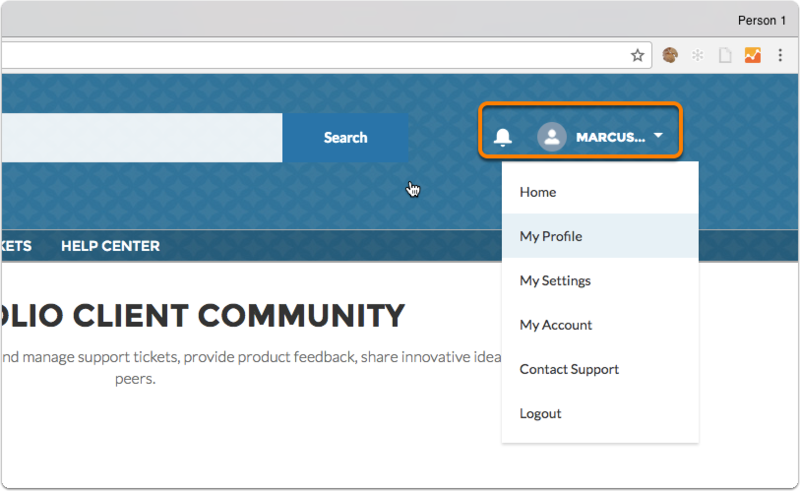 Click the Change Password link to update your Interfolio Client Community Password. This password, and password reset, will not affect your login or credentials for Interfolio products. 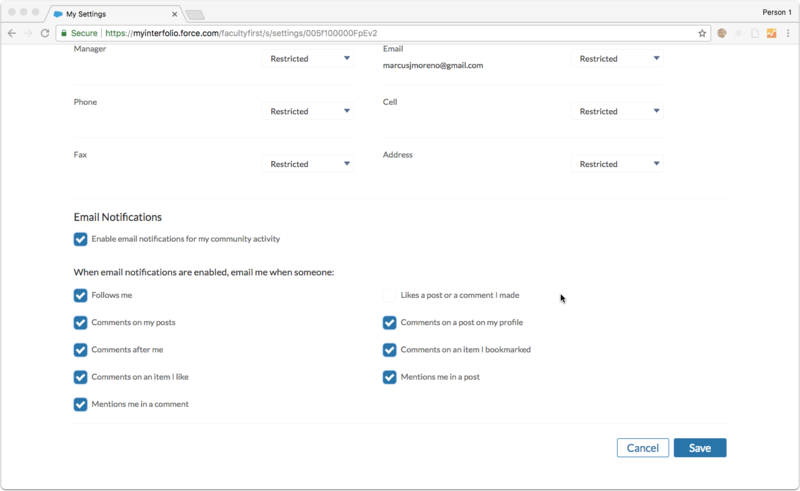 Scrolling down the page, you can control your profile visibility for each field in your public profile form, within the Interfolio Client Community. Clicking on the help icon will display more information about each choice in the dropdown fields in the Profile Visibility section. Members - Visible to the logged-in members. Public - Visibile to anyone viewing pages that don't require login. 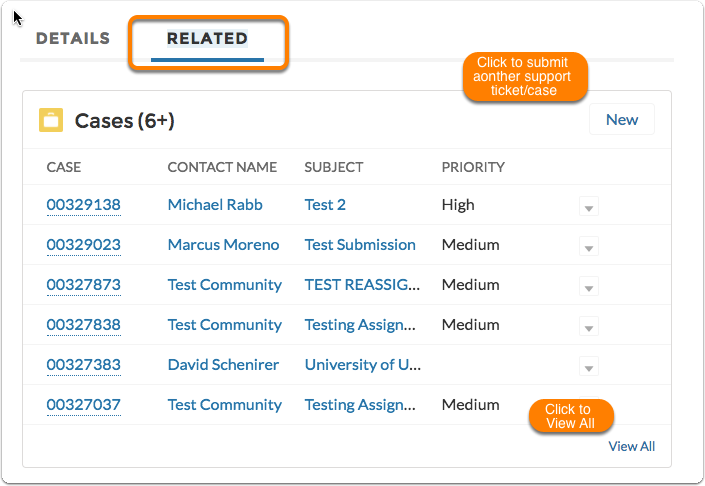 Check/Uncheck to Enable/Disable Email notifications for the following topics, only related to the Interfolio Client Community, not relevant to Interfolio products. When finished with all changes on the page, click Save to preserve the changes, cancel to return to previous settings. Account, in this page, is synonymous with institution. You should see information about your affiliated institution and related activity, and here you can also follow the institution. 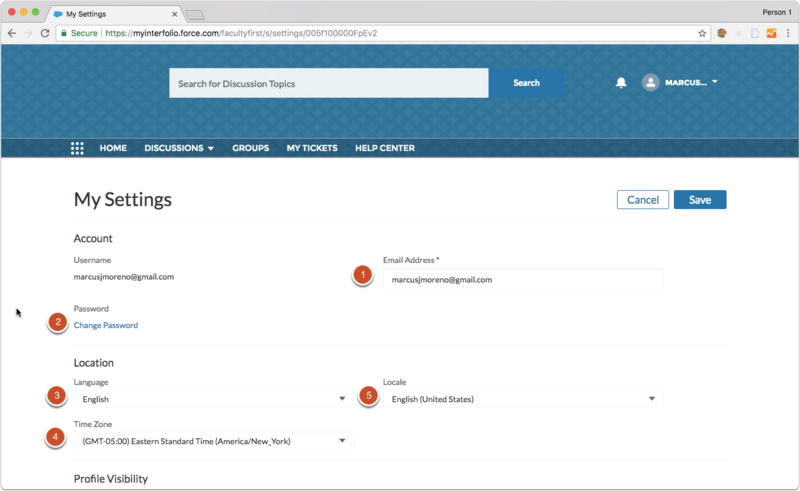 Select Related to view tickets that have been submitted by the institution users. Clicking this will launch the submitting a ticket form for you to enter information. The more information that you can provide, the more effective the support we can offer. 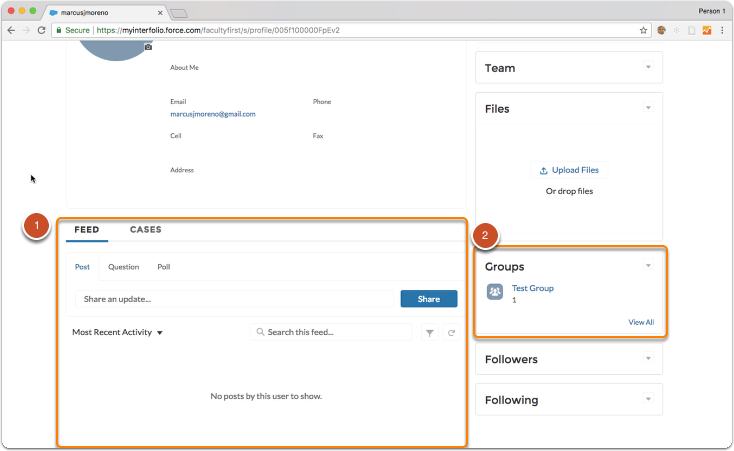 With images and workflow descriptions, agents can quickly identify and report the issue. 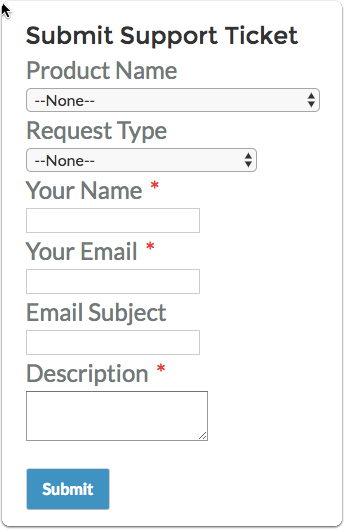 After you submit, you can respond to the automated email with pictures or more information as you gather it.